It was a victory 2,121 days in the making for the Washington Redskins but it fell into the hands of the Dallas Cowboys' special teams. 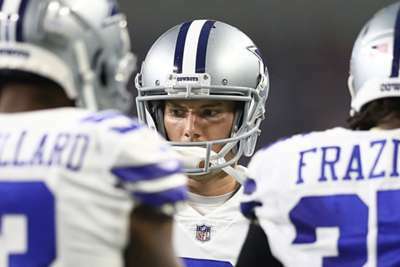 The Cowboys had a chance to pull ahead late in the fourth quarter of Sunday's contest, as they neared the red zone but would ultimately settle for a field-goal attempt to try and send the game into overtime. It was the first time the Redskins beat the Cowboys at FedEx Field since Washington's NFC East-clinching win over Dallas in December 2012. The win was not Washington's best outing. The Redskins have gone 11 games without a third-quarter touchdown, and had to settle for a field goal to pull ahead of the Cowboys. It was that 21-yard make by Dustin Hopkins that inched Washington ahead for good. Buffalo Bills running back LeSean McCoy left Sunday's game against the Indianapolis Colts in the first quarter with a head injury. Buffalo later announced he would not return. New England Patriots running back Sony Michel got twisted up with Chicago Bears defenders on a fumble and suffered a knee injury in the second quarter. He was quickly ruled out after being helped off the field and to the locker room. Tampa Bay Buccaneers linebacker Kwon Alexander hurt his knee against the Cleveland Browns, and the team fear he might have torn his anterior cruciate ligament. Alexander never returned to the game after sustaining the injury, and is due for an MRI. Minnesota Vikings cornerback Xavier Rhodes was carried off the field with a left ankle injury in their matchup against the New York Jets. It was later reported that head coach Mike Zimmer believed Rhodes suffered an ankle sprain. Saints quarterback Drew Brees became the fourth player in NFL history to throw for 500 TD passes, while he became the third QB to beat all 32 NFL teams after edging the Ravens. The Colts' blowout victory over the Bills is just the latest accomplishment for quarterback Andrew Luck. He completed 17 of his 23 passes for 156 yards and four touchdowns. He has four successive games with three or more TD passes – the longest active streak in NFL. Tennessee have some serious work to do with their two-point conversion plays. The Titans have now failed on seven consecutive two-point conversion attempts dating back to the 2015 season, and they passed on all seven of those attempts. Jaguars head coach Doug Marrone on why he benched quarterback Blake Bortles: "[The] thought process [was]: 'Hey listen, I'm going to take the quarterback out' — not like he played worse than anyone out there. He had two fumbles. I just literally did it to try and get a damn spark from this football team to put everyone on notice." Titans coach Mike Vrabel on why he went for a potential game-winning two-point conversion: "I told the team that we made a decision that we're going to be aggressive. If we scored, when we scored, if there was less than 40 seconds we were going to go for two to win the game. If there was [over a minute], we're gonna kick the extra point and go play defense."